Fermentation of Molasses - Naturebioscience. Ethanol being a renewable resource of energy is probably a cleaner alternative to fossil fuels. Demand for Ethanol is increasing day by day due to its versatile application and utility. To meet the acing demands, production of Ethyl Alcohol or Ethanol through fermentation is gaining momentum and acclamation globally. At industrial level, ethanol is prepared by molasses fermentation. A residue begotten from sugar cane processing, molasses is the mother liquor left after crystallization of sugarcane juice. It is a dark colored viscous liquid that contains approximately 40 to 50% fermentable sugar. Being one of the earliest biotechnologies used by humans for the production of Ethanol, molasses Fermentation is also the most cost-effective way. Other than the formation of ethyl alcohol or ethanol, molasses is a microbiological energy source that helps in the process of growing yeast, bacteria and moulds. Not only is it the most cost-effective amongst the available energy sources for such industries but is also the easiest to incorporate in fermentation processes. A sound source of B Vitamins and biotin in molasses hastens fermentation processes that help in faster ethanol production. 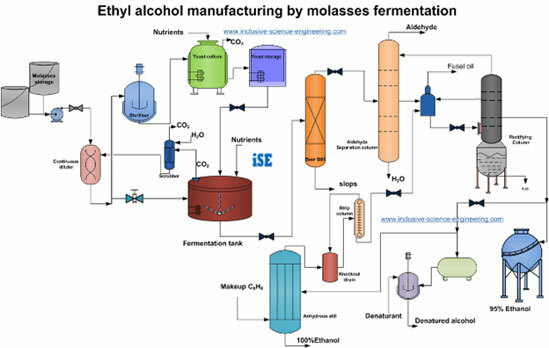 Molasses Fermentation is a biological process in which sucrose from molasses is converted into cellular energy that eventually produces ethanol and carbon dioxide. Molasses from sugarcane or sugar imparts an appropriate substrate for ethanol production. They are the basic sources of Sucrose (C12H22O11) which is present in them in concentrated sugar form. Only 50% of molasses contains eminent reducing sugars that prove useful in the fermentation process. Molasses constitutes many fermentable and un-fermentable sugars with traces of Nitrogen, Phosphorus, Solid Sludge and Ash. Fermentable sugars are directly used during Molasses fermentation, while the un-fermentable sugars like Starch, Cellulose or Pectins can be used only after being hydrolyzed. With the help of apposite enzymes and reactions, Ethanol is formed. The Ethanol begotten from the whole process is used in the form of absolute or rectified spirit. We specialize in manufacturing products that boost ethanol production. Our world class products like NatureFermP catalyses fermentation and increase recovery from the process of Molasses fermentation while, NatureBio-MProtekt Controls TVA and bacterial Contamination during summers. TRS Plus manufactures by us is a yeast friendly enzyme that is based on TRS preservatives. NatureFerm-P: Fermentation booster to increase recovery in molasses fermentation. NatureBio-MProtekt: Bacterial contamination & TVA control in molasses fermentation during summer. TRS Plus: Yeast friendly enzyme based TRS preservative.